Mini Raw Bundt Cakes - simply & healthy vegan recipes that taste amazing! These mini bundt cakes are a sweet dessert treat for every occasion. The cakes are pretty and easy to make and you don´t even need to soak the cashew nuts! The base is a simply chocolate layer and there between is a very creamy salt-caramel layer with peanut butter. I recommend to make some bliss balls of the dough and roll them in melted chocolate. The healthier kind of ferrero bliss balls or white nougat balls. This is a raw cake recipe, which means the cakes don´t need to be baked at all! All the healthy nutrience in the cakes makes this dessert to a very guilt free one! I hope you love it as much as I do! Start with the filling: blend the cashew nuts and sunflower seeds in a high speed blender until you have a fine flour. Add the dates and the no-dairy milk and blend until the dates are well combined with the dough. Add all the ingredients and blend for an other minute. 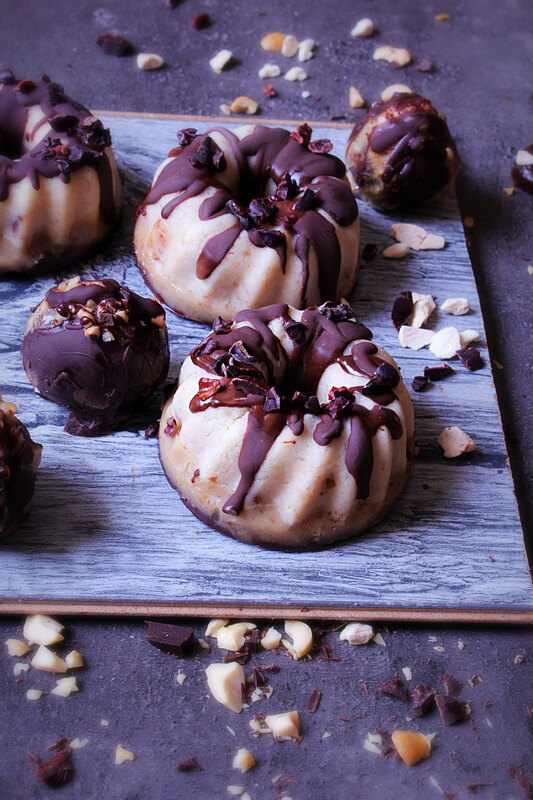 Press the dough evenly in small silicon molds and if you wish you can roll some of the dough to bliss balls and coat them with melted chocolate and peanut butter or other nuts. Place the molds in the freezer for at least 15 minutes. Make the caramel cream: blend all the ingredients for the caramel until very smooth. For this you will need some patience. Turn off the blender every minute or so to let it cool down a little. Spoon it over the coconut filling. Let it freeze for a couple of minutes. For the chocolate layer simply mix together the ingredients or melt the chocolate in a water bath and pour it over the caramel cream and freeze till set. Take out the molds some minutes before serving them. 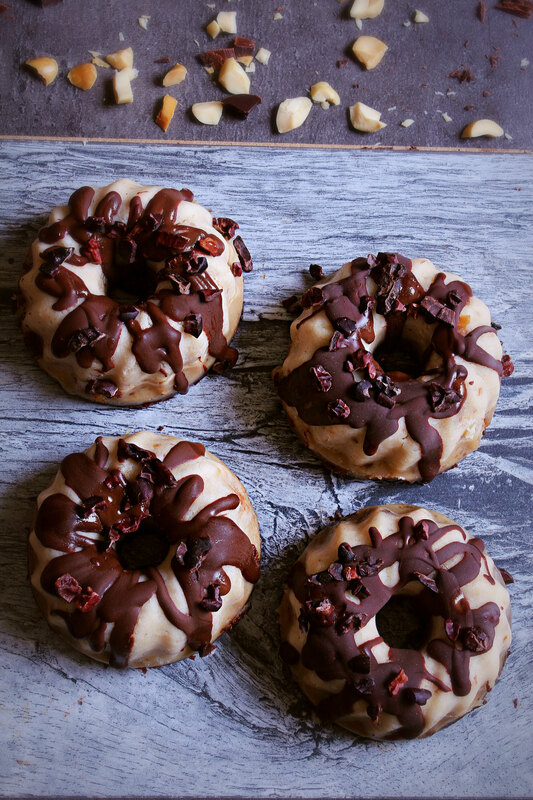 Decorate the mini bundt cakes with melted chocolate and cacao nibs. Storange in the freezer or fridge. I would love to know what you think - leave me a comment!